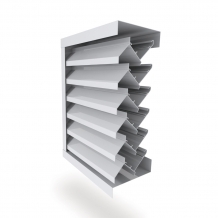 Powered by nature and scientifically designed, Airocle’s range of 2 stage / chevron louvres has been developed to offer a fully flexible, yet high performance solution for your building ventilation and screening needs. Used as second stage louvres, our range of louvres offers the perfect protection against Australia’s harsh weather conditions. Airocle’s 2 stage louvre ventilation is designed to provide optimal ventilation while ensuring total weather protection of your commercial, industrial or community buildings. With innovation as a priority, our products guarantee a completely natural form of ventilation with up to 45% of free open area combined with the ability to eliminate all wind driven rain in the most exposed locations. As full chevron, our range of louvres is ideal to maximise privacy in apartment building or to hide equipment and plant, while still maximise airflow and weather protection. Silent to run, louvre ventilation uses natural airflow to control temperature and inflow of fresh air into the structure. Architecturally design to suite the aesthetics of your building and can be custom made for your needs with a choice of profiles, materials and colours. Optimal airflow with respectively 45% and 42% of free open area for second stage and full chevron louvres. Highly versatile and flexible. Our products can either be used as second stage louvres with single stage louvres or as full chevron louvres.